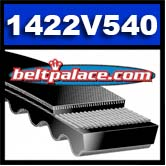 1422V540 Industrial Grade Multi-Speed Belt. Spec: 54.8 inches O.C. - top width 7/8"-angle 22.